There’s a small church on South McCrary St in Woodbury that’s been having a revival for nine weeks now, with no signs of stopping anytime soon. You might have driven by the building on your way to Piggly Wiggly or Ace Hardware and seen the sign out front that says, “Josiah Generation.” Well, if you’ve been wondering what the Josiah Generation is all about, here’s the scoop. The Josiah Generation was founded by Junior and Loretta Rhodes a year-and-a-half ago in Woodbury. The church takes its name from a Bible passage in 2nd Kings about the young King Josiah. He became king at age 8, and by age 16 he had rid the land of all idol worship. 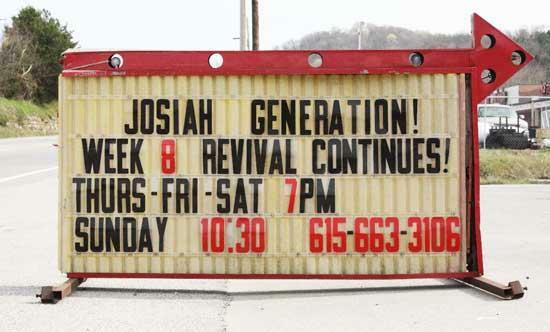 Though this church is reasonably small (as churches go), they are affiliated with the larger “Josiah Generation” movement, based out of World Revival Church in Kansas City, Missouri. Two things you won’t find at Josiah Generation are a dress code and “idle” worship. I asked the Co-Pastors what their inspiration was for founding a new church, and they were more than happy to share their story. So, 10 years ago, they founded Mercy Seat Ministries in Huntsville, Alabama, a church specializing in delivering young people from drug addiction. Most churches have your typical Sunday morning service and a mid-week night service, but the Josiah Generation seems to be going full-time. For the past nine weeks, they’ve been holding services Thursday through Sunday, and they plan to keep it going as long as they can. “We came back from a conference, and our young people were really on fire for God. Our worship leaders are teenagers, and they were being inspired to write new songs and praise the Lord as much as possible. We opened the church doors, and they started coming every night,” says Loretta. Both Junior and Loretta have full-time jobs outside of the church, so as soon as they clock out, they head down to the church and get ready for the revival. Some days the congregation is small, but a core group of families make it almost every night. “They just don’t want to stop!” she adds. The Rhodes and the other members of the Josiah Generation plan to keep the revival going “as long as it takes.” Thanks to Facebook, the word of their small movement has spread globally. Large congregations from other churches (some numbering over a thousand) have planned trips to Woodbury to participate in the revival themselves. They also have an appearance by a nationally-known preacher, Dustin Smith, in the works. If you like to sleep in church, or you’re just going to keep up with the Joneses, Josiah Generation probably isn’t the place for you. But if you’re looking for “an encounter with the Living God” or a church with no dress code, you may want to check it out for yourself. The Josiah Generation is located at 940 South McCrary St. in Woodbury. They hold evening services Wednesday through Saturday, beginning at 7 pm, and Sunday morning service begins at 10:30 am. You can also get more info or check out some testimonies of healing on Facebook at www.facebook.com/josiahgeneration.